Brownies: I make them. I eat them. But I don’t know that I really, sincerely, truly like them. Chocolate craving at home? Brownies are fast, easy, and I know I’ll always have the ingredients. 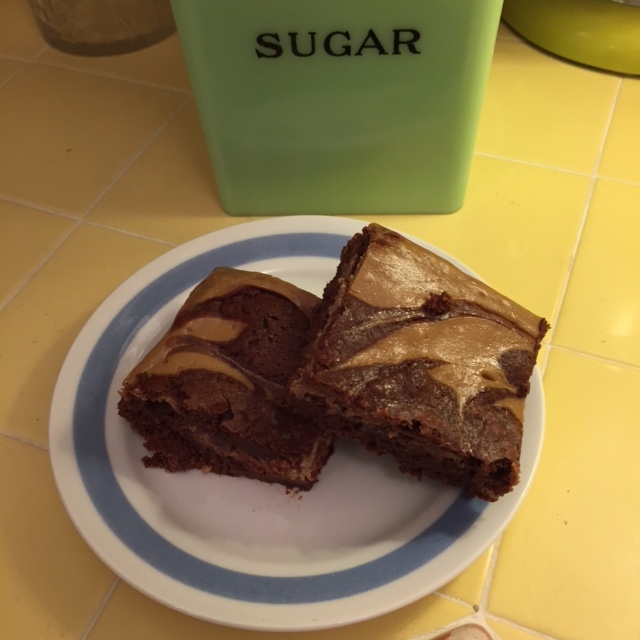 (My go to recipe is Supernatural Brownies from Nick Malgieri’s Chocolate, reduce sugar to ½ cup.) But take me to a restaurant, café or bake shop? I will never order a brownie. Kids bake sale or potluck in the office? I will always pass up the brownies. I will say it’s because they are usually dry or too large or have nuts or whatever – when really, I’m just not sure I like brownies all that much. Yet, I found myself standing in front of the fridge the other day, trying to remember why I bought that tub of mascarpone. 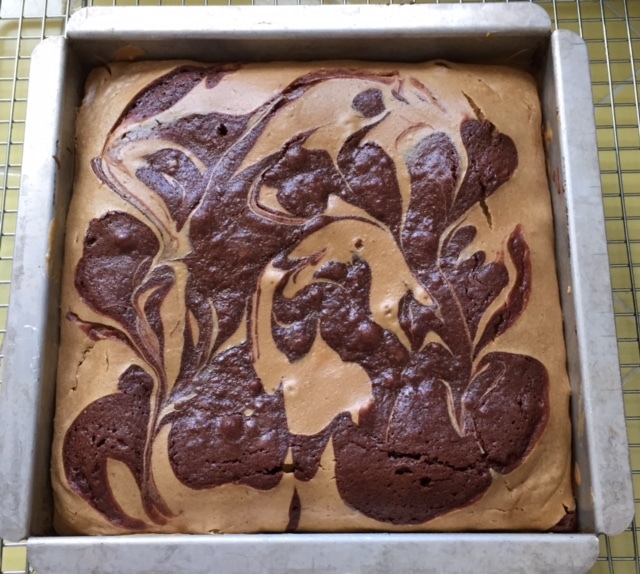 It’s like cream cheese – maybe now’s the time to try making a swirl brownie? Never had one, never made one. I Googled recipes but none appealed or they had an ingredient I didn’t have like buttermilk. So I kicked it old school and went to my baking library, taking down Alice Medrich’s Chewy Gooey Crispy Crunchy Melt-in-Your-Mouth Cookies. 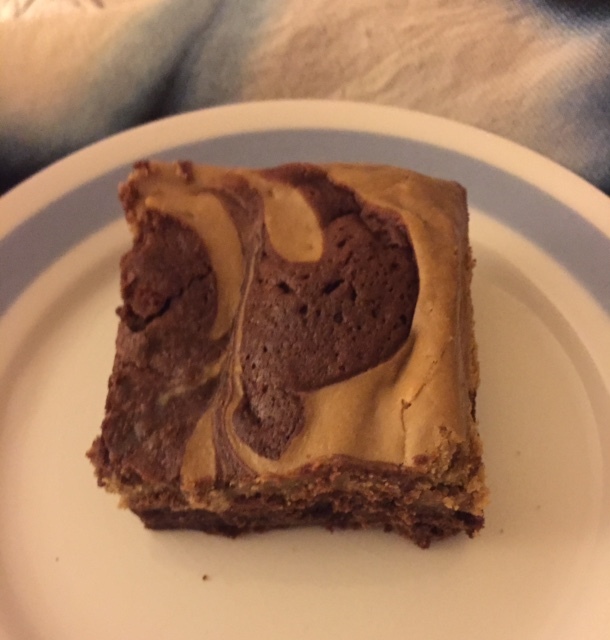 Et voila, Espresso Swirl Brownies. Coffee + chocolate = good thing, so I dove in (using the variation for cakier brownies). Note: Mascarpone is not really “like” cream cheese. Who knew some slight overbeating would render a curdled liquid? But since I was already in for a quantity of chocolates and butter, I proceeded. Sure the mixture looked more like grainy mustard and the whole effect was not appetizing and I needed to add another 20 minutes to the cooking time and…. I should’ve stopped at curdled. I’d thrown down my own gauntlet, though, so the next day I met Alice again in the kitchen with 8 oz. of Philadelphia bra nd in hand. The recipe and techniques are simple and easy, the results picture perfect. And the brownies? Really delicious. The base is moist without overdoing the chocolate; the espresso cream cheese is light and perfectly balances the chocolate. As for brownies in general, though, the jury’s still out. The recipe Espresso Swirl Brownies can be found here, attributed to an earlier Alice Medrich cookbook. This entry was posted in Recipes by Caroline Siemers. Bookmark the permalink.